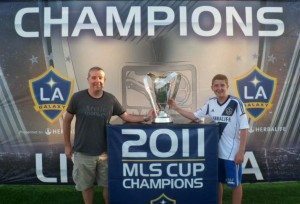 Adrian Conway and son Tom have just come back from California and while out there, took in the LA Galaxy v Real Madrid match at the Home Depot Centre on the 4th August. ‘We decided to get our fix of pre-season while away on leave, it beats baseball which we couldn’t get used to a few days earlier. It was quite the occasion with all the players turning out in force. 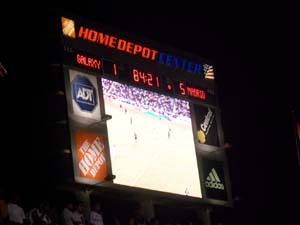 Becks, Robbie Keane and Donovan for the Galaxy and then everyone in the line up for the Galacticos. It was a record attendance of 30,317 and Madrid won at a canter 5-1. My son though decided to wear his new Galaxy top and fit in with the locals. Saying that, 70% of the crowd were Mexican and supported Madrid. I now know how Davy Crockett felt at the Alamo! At least we got our hands on the MLS trophy. Even that didn’t seem real, rather lightweight’.